Comedy thriller. American Tom Penderel is invited by his friend Casper Femm for a weekend at his family’s remote mansion on darkest Dartmoor. Once there, he meets the other members of Casper’s family, who all seem to be teetering on the verge of insanity. He also discovers that Casper has been killed just before his arrival! With typical immodesty, William Castle allowed himself a credit for Producer/Director and then another one solely for Director. On the other hand, it might just have been an error on the part of those responsible for the titles. Hammer seemed to be having a bit of a rough ride at this time. “The Phantomof the Opera” was not doing good business at the box office and they still had two completed films (“The Damned” and “Cash on Demand”) awaiting release. 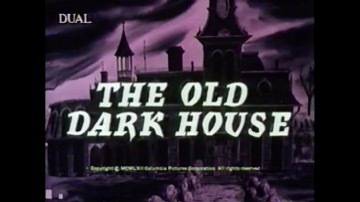 “The Old Dark House” made the total three and in Britain it had to wait until 1966 before it escaped into cinemas as the second half of a double bill with the spoof western “Big Deal at Dodge City”. Janette Scott, who is the daughter of actress Thora Hird, got a bit of a shock when she walked into her bathroom at Bray Studios on the first day of shooting. As a gesture of welcome, William Castle had filled it with dead flowers! 6). Audiences to “Mr Sardonicus” (1961) were invited to take part in the “Punishment Poll” and vote thumbs up or thumbs down to decide the villain’s fate. In reality, of course, the film only had one ending anyway! Castle’s other work includes “The Night Walker” (1964), starring Barbara Stanwyck, and two films starring Joan Crawford – “Strait-Jacket” (1963) and “I Saw What You Did” (1965). All his films are worth seeing, if only to wonder at the sheer bare-faced cheek of the man!